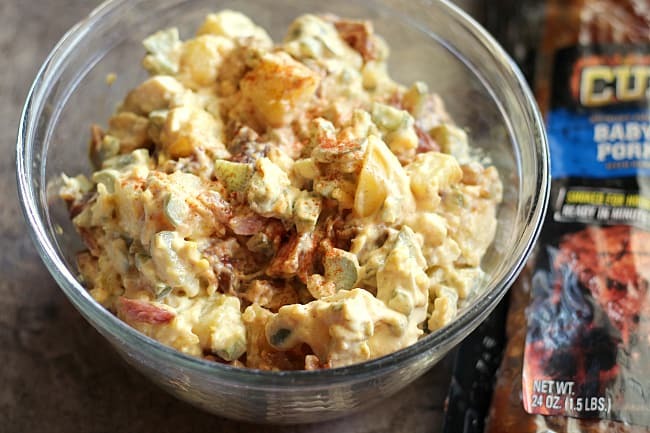 BBQ Rib Potato Salad - For Family Dinners, Potlucks, or BBQs! 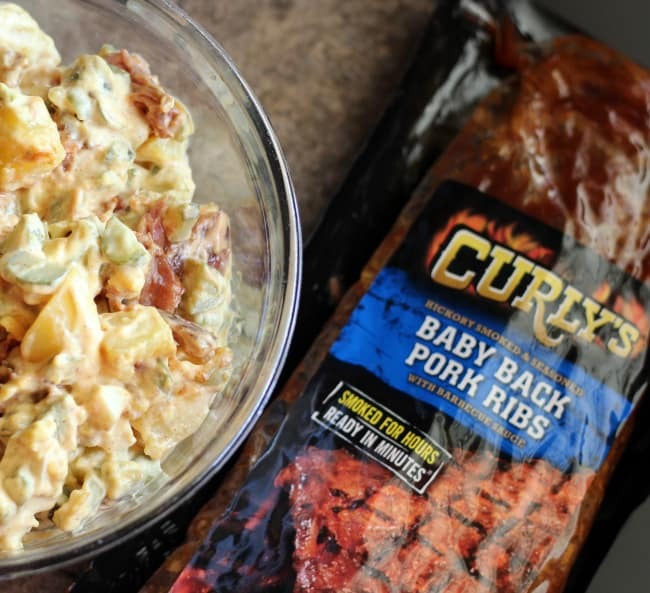 BBQ Rib Potato Salad has been brought to you by Curly’s. All opinions are mine. My basketball loving family loves March. College, professional, development league, and peewee basketball are life these days. 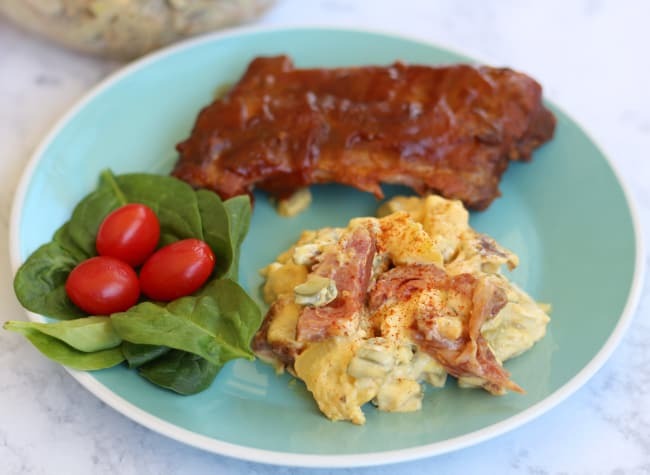 We love a good basketball watching party, and this BBQ Rib Potato Salad is perfect! BBQ is perfect for just about any occasion, but a BBQ and Basketball watching party is perfection. 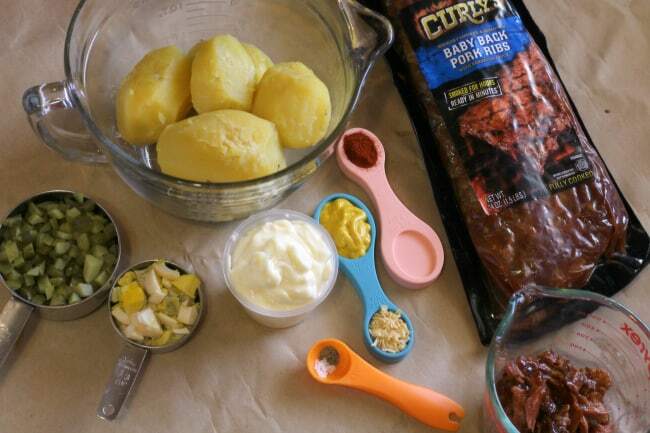 I created an all-in-one bbq meal that is easy to make, especially with Curly’s Baby Back Pork Ribs. 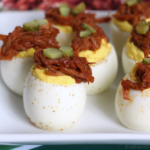 Let me show you just how easy this recipe is to make for the big game! You may not think that these flavor combinations would work int he same bite, but trust me…they do! 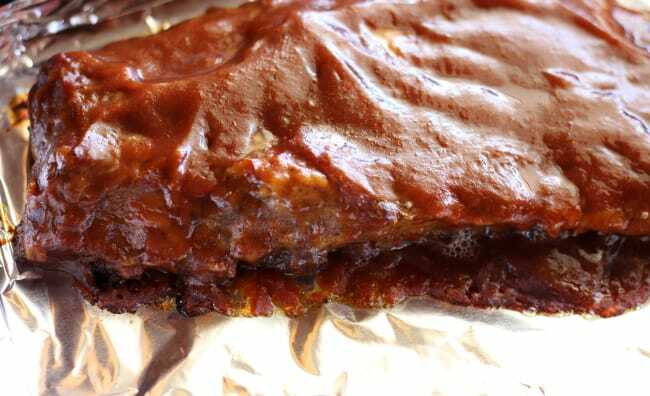 Curly’s makes it easy because you just have to warm the ribs, either on the grill, in the oven, or even in the microwave. I cooked all of my potatoes and eggs at the same time, in the Instant Pot, but you can boil them if you prefer. When ribs, potatoes, and eggs are all cooked, let them cool for a bit. Chop pickles and get the mayo, mustard, onion flakes, salt, pepper, and paprika ready. Chop hard boiled eggs, peel and cut potatoes in 1″ cubes, and using a sharp knife, carefully cut all meat off of rib bones. Combine pickles, mayo, mustard, onion flakes, salt, pepper, and paprika in a bowl. I like to add in a little bit of pickle juice to the mixture, but that is up to you. 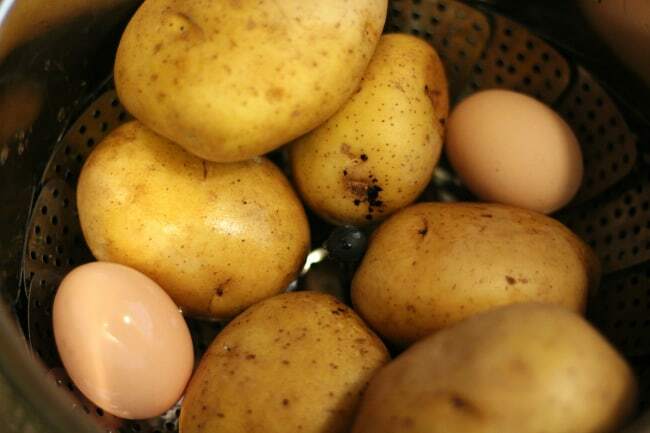 Fold in chopped eggs and half of the chopped potatoes. This meal is perfect! You can taste the bbq flavor, alongside all of the delicious goodness of potato salad. What is your favorite BBQ meal or side dish? 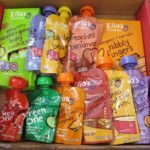 Bring something new to the BBQ! 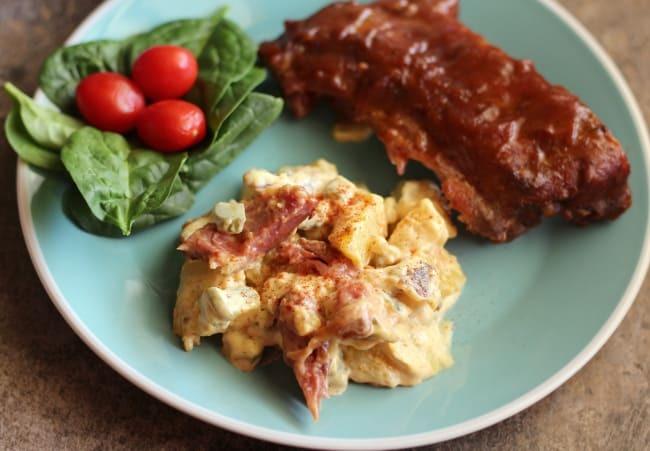 This BBQ Rib potato salad comes together well! While your ribs are warming, cook your potatoes and eggs. You can use whatever method you prefer, but I just threw them all in the Instant Pot for about 15 minutes on a steamer basket with a cup of water in the bottom. Set it on manual, and everything was done perfectly! When ribs, potatoes, and eggs are all cooked, let them cool for a bit. Chop pickles and get the mayo, mustard, onion flakes, salt, pepper, and paprika ready. 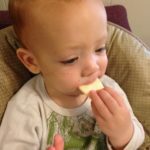 Peel and cut potatoes in 1″ cubes. 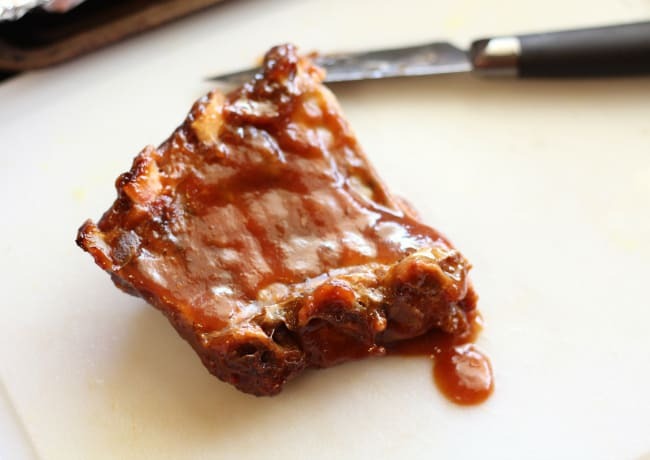 Using a sharp knife, carefully cut all meat off of rib bones. Chop meat into bite sized pieces and set aside. Combine pickles, mayo, mustard, onion flakes, salt, pepper, and paprika in a bowl. I like to add in a little bit of pickle juice to the mixture, but that is up to you. Fold in chopped eggs and half of the chopped potatoes. Stir well until everything is coated. Stir in half of the remaining potatoes and stir well. If it looks perfect to you, save the remaining potatoes for another recipe, if not go ahead and fold them all in and stir. Lastly, fold in the chopped bbq rib meat. 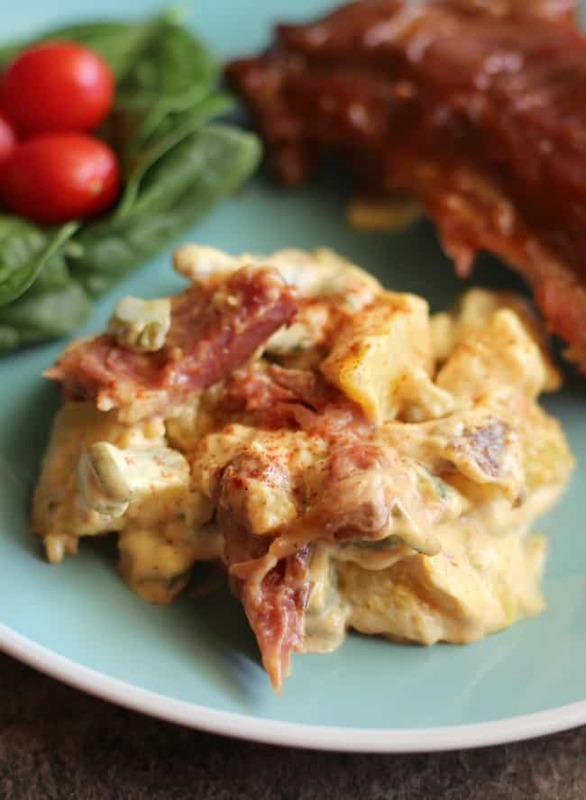 Serve as a main dish or as a side dish for more bbq ribs, chicken, or another bbq meat! This sounds like an interesting combo. I bet it would be a hit at summer cookouts! Totally going to bring this to summer BBQs! 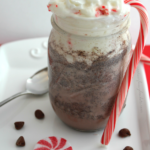 Looks delicious to share.